A new OPB Oregon Experience documentary features items from the Verdell Burdine and Otto G. Rutherford Family Collection in Portland State University Library Special Collections. 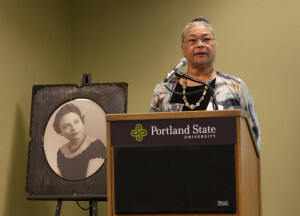 Portland Civil Rights: Lift Ev’ry Voice also includes interviews with Charlotte Rutherford, donor of the Rutherford Family Collection, and Senator Avel Gordly, who has placed her papers with us, as well as PSU faculty members Dr. Darrell Millner of Black Studies and Dr. Karen Gibson of Urban Studies and Planning. Watch the documentary on OPB or online through their website. And listen to Charlotte Rutherford discuss the family materials she donated to PSU Library. Charlotte Rutherford speaking at the Library in 2012.